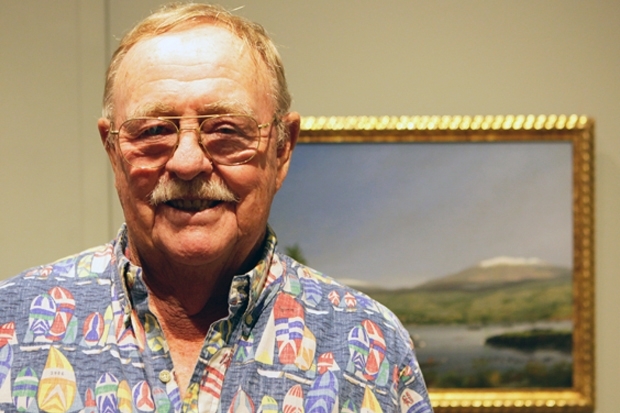 Martin “Mac” McMorrow became a Honolulu Museum of Art docent in 2004, but his memories of the museum go back much further than that. And as Mac tells it, the museum helped him find his career path. “In my high school days, I took a drawing course here in the mid-50s. That convinced me I needed to go into the sciences instead of the arts,” he laughs. But his appetite for art was whetted, and later, after serving in the Navy, he found himself working near the museum. “At lunchtime I would walk over and go through the galleries a couple times a week,” he reveals. The museum has been a part of his life for almost 70 years, and now he shares his knowledge of HoMA and Hawai‘i with museum visitors weekly. Martin McMorrow, who was born on Hawai‘i Island, points out places from his childhood in Keaukaha on his favorite painting in the museum’s collection, Hilo from the Bay by James Gay Sawkins. It’s his personal history that draws him to the Arts of Hawai‘i Gallery when he’s asked to point out his favorite work in the collection. While his favorite artists are all in the Volcano School, his favorite work is James Gay Sawkins’s Hilo from the Bay, painted in 1852. Museum staff know with certainty (and gratitude) that what Mac and his fellow docents do makes a difference. Every day they are shaping the visitor experience at the museum. Nice reading Mac. This is really interesting- i did not know that you were born on the big island…but i do know you love the museum and taking folks around and making their experience very rich. Thanks for sharing.